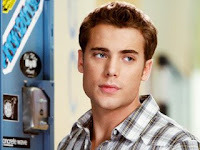 Sources confirm that Dustin Milligan, who plays affable jock (and one half of 90210's central super couple) Ethan, won't be returning to the show in the fall -- at least not full time. Reps for The CW and producer Paramount declined comment, but a 90210 insider confirms that Milligan's contract option is not being picked up for next season. The source adds that the door is being left open for the actor to briefly appear in the fall to wrap up Ethan's story. The departure of one the show's most high profile leading men is the clearest indication yet that Sinclair's ongoing reboot of the reboot will be anything but minor. Viewers will get their first taste of the Gilmore Girl alum's new vision when 90210 returns from its winter hiatus this Tuesday with a hilariously campy outing that features the primetime soap trifecta: stalkers, street-racing, and scenery-chewing! Looking ahead to season 2, Sinclair said last month that she wants to "reconceive things visually. There are opportunities to embrace California culture visually in terms of fashion and style; I want it to be more contemporary. "If Gossip Girl is about youth in New York," she elaborated, "I want to [make 90210] about youth in L.A. and Beverly Hills." The writer-producer also plans to rely less on 90210 vets such as Jennie Garth, Shannen Doherty, and Tori Spelling to boost ratings. "The show tried to be a lot of things to a lot of people in its first season," she conceded. "I think the center lies with the generation of kids that are in high school now. I'm not interested in casting people for stunt value." Sinclair, who replaces original show-runners Jeff Judah and Gabe Sachs, said the show will benefit from having a singular vision. "The advantage of having one person -- me -- [in charge] is that scripts, what happens on the set, casting... it all speaks in one voice." Thoughts on Sinclair's new 90210? Waiting to pass judgment until you see this season's remaining episodes? Is the loss of cute-but-boring Ethan a step in the right or wrong direction? Sound off below!